Is Donald Trump Really Starting a Trade War? 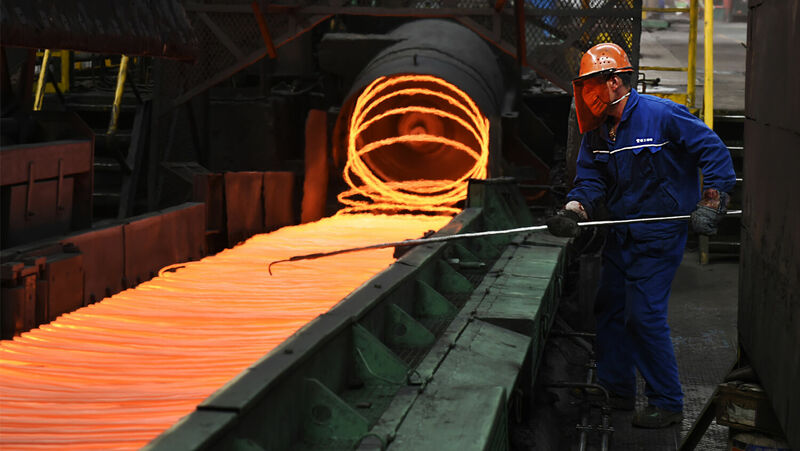 A Chinese employee sorts red-hot steel at a plant in Zouping in China’s eastern Shandong province on March 5. America has been under sustained economic assault for decades. Donald Trump is about to single-handedly plunge the world into trade war. That’s the general narrative in the media at least. The facts paint a very different picture. America has been under sustained economic assault for decades. The only reason there hasn’t been a trade war is because America hasn’t been fighting back. Instead, it has been a trade beatdown. American firms must hand over trade secrets to China if they want to do business there. Generally they’re either forced into a partnership with a Chinese firm or forced to let officials examine technology that is sensitive. “The goals of Chinese policy are easily summarized: They wish to extract technologies from Western companies; use subsidies and nontariff barriers to competition to build national champions; and then create a protected domestic market for these champions to give them an advantage as they venture out in the world,” wrote James Andrew Lewis, senior vice president at the Center for Strategic and International Studies, last summer. China manipulates its currency to give it an unfair advantage against the United States. The Economic Policy Institute estimates that the manipulation increases America’s trade deficit by $200 billion to $500 billion a year. These are huge figures. Putting a stop to this practice would increase the size of the American economy by 2 percent to 4.9 percent a year, they estimate. They estimate that eliminating the manipulation would create between 2.3 million and 5.8 million jobs. Crucially, 40 percent of these jobs would be in the manufacturing industry, which has been hit so hard in recent years. This is just the briefest overview of a huge subject. I’m working on an article for our next issue of the Trumpet newsmagazine, but these statistics are so shocking and the subject is so much in the news that I wanted to share them with you right away. They expose the war both China and Germany have been waging on the U.S. If you find economics difficult to follow, I aim to make this as clear and easy to understand as possible. This subject is far too important to leave it only to those with a background in economics. This subject is also important in Bible prophecy. Isaiah 23 talks specifically about China and Europe banding together in a trade relationship. Other scriptures reveal that this trade bloc is at economic war with America. These powers are already fighting America! And the Bible prophesies this will get much worse. Unfortunately, despite the fact that most mainstream news sources have highlighted China’s trade abuse before, this dimension is completely missing from most reporting on the subject today. For more on this topic and other important stories missed by most of the media, please stay tuned to theTrumpet.com. And for more in-depth reporting, be sure to subscribe to the Trumpet magazine.